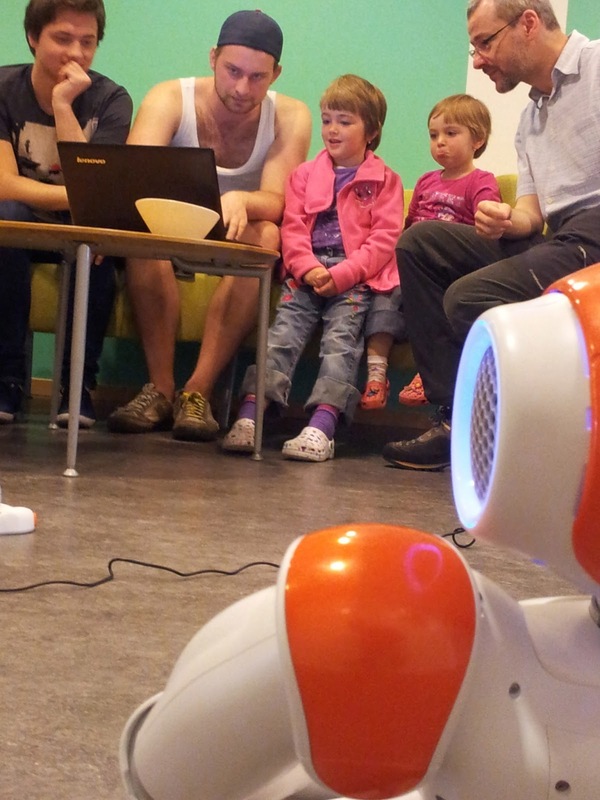 The special guests became interested in meeting the robots after seeing a segment on TV4 about the NAO Halmstad Group. The visit included showing off some of the capabilities that the NAOs come pre-programmed with (including dancing, Tai Chi, walking, speech synthesis, and speech recognition) and an interactive discussion of how the robots can be programmed by a sequence of basic primitives such as walking, turning, moving hands, closing the grip, and so on. This was followed by a discussion of what these robots are made of, including cameras, motors, and (as one of our young guests pointed out) microphones. They were also showed a recording of a recent walk by Jonson using code that was developed by our colleagues at the AMBER lab at Texas A&M. The NAO Halmstad Group consists of five same-batch NAO robots, and is intended to be used as a common platform for experimentation among four universities, including Rice University, Halmstad University, Texas A&M, and Al-Faisal University. This experiment constitutes the first use of the platform for this purpose.